Born in Las Palmas de Gran Canaria (Spain), she completed her studies under the guidance of baritone Jerzy Artystz. After being awarded in several international singing competitions, Yolanda Auyanet began her professional career debuting as MUSETTA in La Bohème in Bari at the age of 23 and, soon afterwards, GILDA in Rigoletto and VIOLETTA in La Traviata at Teatro de la Zarzuela in Madrid. During past seasons, she has been a touching CONTESSA in Le Nozze di Figaro in Seville, ADINA in L’ Elisir d’ Amore in Pamplona, GIULIETTA in I Capuleti e i Montecchi in Las Palmas, ZILIA in Cristoforo Colombo in Seville, MIMÌ in La Bohème in Savona and Bérgamo, followed by DONNA ANNA in Don Giovanni for Maggio Fiorentino, conducted by Zubin Mehta, DESDEMONA in Otello in Módena and LIRÍOPE in Viento es dicha de Amor in Madrid . 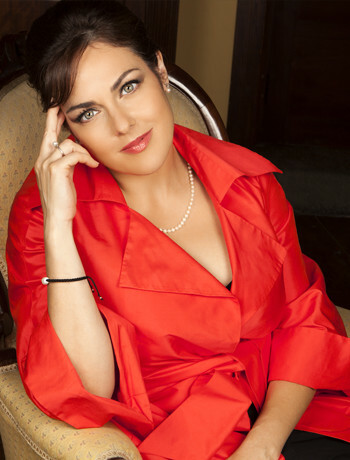 Among recent commitments, we also remember her FIORDILIGI in Così fan tutte in Cagliari and Bologna as well as her participation in Una fête pour Rossini, together with Juan Diego Flórez and Anna Bonitatibus at Festspielhaus in Baden-Baden, ELISABETTA in Roberto Devereux in Tenerife conducted by Evelino Pidò, VITELLIA in La Clemenza di Tito in Valladolid and DONNA ANNA in Don Giovanni in Tenerife. She has worked with renowned conductors like Zubin Mehta, Michele Mariotti, Alberto Zedda, Evelino Pidò, Bruno Bartoletti, Alan Curtis, Christopher Franklin, Lü Jia u Ottavio Marino, among others, as well as with stage directors like Franco Zeffirelli, Ripa di Meana, Nuria Espert, Daniele Abbado, Jerome Savary and Damiano Michieletto. Recent commitments include both FIORDILIGI in Così fan tutte and MATHILDE in Guillaume Tell at the Teatro Comunale in Bologna, DONNA ANNA in Don Giovanni in Seville, Modena, Piacenza and Lucca, LUCREZIA in I due Foscari in St. Gallen and DESDEMONA in Otello in Las Palmas, MARIA STUARDA in Maria Stuarda and LEONORA in Il Trovatore in Toulon and in Tenerife and her highly acclaimed debut in the title role of Bellini’s NORMA in Norma in St. Gallen. In season 2016 in 2017 she made her successful debuts as ELISABETTA DI VALOIS in Don Carlo in Marseille as well as ANNA BOLENA at the Teatro Regio in Parma, her debut as a soloist in Verdi’s MESSA DA REQUIEM at the Teatro Carlo Felice in Genoa as well as VITELLIA in La clemenza di Tito at the Teatro Real and NORMA at the Teatro Massimo in Palerm. She kicked off season 2017 in 2018 with a further role debut as ‘Donna Elvira’ in DON GIOVANNI in Nancy and Luxembourg before returning to the Teatro Real Madrid for ‘Mimi in LA BOHEME. She furthermore performed ‘NORMA’ at the Opera in Nice as well as in Palma de Mallorca, DON CARLOS in Tenerife, and debuted as ’Amelia’ in SIMON BOCCANEGRA at the Teatro Comunale Bologna. The upcoming season 2018 in 2019 include ‘LEONORA in Il Trovatore at the Royal Opera in Liege in Belgium, her debut as ‘ALICE’ in Meyerbeer’s ROBERT LE DIABLE at the Théatre La Monnaie in Bruxelles, ‘Liu’ in TURANDOT at the Teatro Real Madrid, NORMA at the Opera Stuttgart and a revival of NORMA in in St.Gallen. Future plans include role debuts as ‘Amelia’ in UN BALLO IN MASCHERA, ‘Imogene’ in Bellini’s IL PIRATA and the title role of Donizetti’s LUCREZIA BORGIA as well as of Puccini’s SUOR ANGELICA.